Pathway lighting is ideal in a garden as it adds to the safety and the visual appeal. The following outdoor pathway lighting ideas can help you create a well designed outdoor space – we go over everything from standard post lights to pergola lighting and string lights. Post lights are the most popular form of outdoor pathway lighting because they are simple fixtures that come in a number of styles. 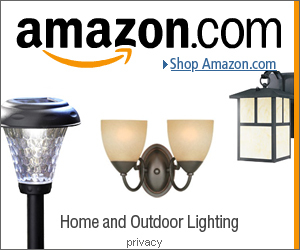 They are usually short which reduces glare and can be easily installed as solar powered or low voltage pathway lighting. If you have any walls lining your pathway, these can be used to fix lights onto. You can either use recessed wall lights, flush mount or lanterns and wall sconces. The wall sconces above can be found here on Amazon. Pillar lighting is when you have a light fixture on a solid base. These bases, or pillars, can be short so that the lights shine on a path or the pillars can be tall to light the entrance of a driveway. If you have any steps along your path there are a few lighting ideas that can be used to light these areas – like lip lighting, recessed or downlights. Have a look at our post here for 5 outdoor stair lighting ideas. String lights are inexpensive fixtures that can come as electric powered or solar pathway lighting fixtures. You can use them to light up pathways by hanging them from trees, fences, the house walls, and polls. If you have a pergola over a section of your path they can have lights attached to them. If you don’t have one, they can be nice additions to a garden. During the day they provide shade, and at night they look great lit up. Tiki torches can line a pathway and provide soft glowing light. It can be a hassle to light a number of torches individually – an alternative is to install gas burning tiki torches that can be switched on all at once from a central valve. Rope lights are led lights incased within a plastic tube. Because the tube is flexible, rope lights can bend and be shaped how you like. They can be fitted along railings or lined along the perimeter of a garden bed. Lighting other areas of a garden can help light a pathway. For example in the photos below, trees and plants have been lit up with spot lights, swimming pool and pond lights also provide indirect path lighting. This is a place where I gather ideas on all things lighting (I’m a wannabe property developer). Lights & Lights also has design guide articles writen by industry experts: our most popular topics are Home, Outdoor, and Wedding Lighting Ideas. © 2019 Lights and Lights. All Rights Reserved.